Alma Cinema i Almaty, Kasakhstan: Reservér nu! 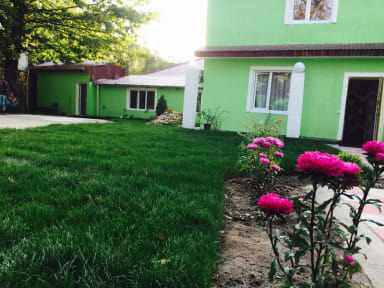 The hostel is located in the old center of Almaty. Near the hotel is Kazakhstan. Near the hostel there is the Kok Tobe cable car, the Palace of the Republic, many different cafes and restaurants. Two minutes from the hostel - Dostyk Avenue where you can easily go by bus to anywhere in the city. 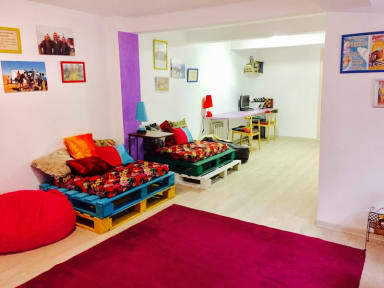 In addition to that in the hostel there is a library, a cable TV and a special playing hall where you can play chess, backgammon and other table-top games. And of course there is a free Wi-Fi network all over the territory of ' Hostel Alma Cinema'. In case of necessity you can use a desktop computer, scanner and printer. At 'Alma Cinema, cleanness and order in sleeping rooms and general purpose rooms are carefully maintained. In each of our rooms there is a conditioner, a mirror, a hairdryer, an iron and a storage box where you can place your valuable things. Each bed is equipped with additional courses of light for reading books. Rooms are executed in an individual comfortable color gamut and have large windows. We are often open to dialog with you and we are always glad to help you in solving various matters.